This is the last day of the kcw kick off week. The sewing starts Monday! 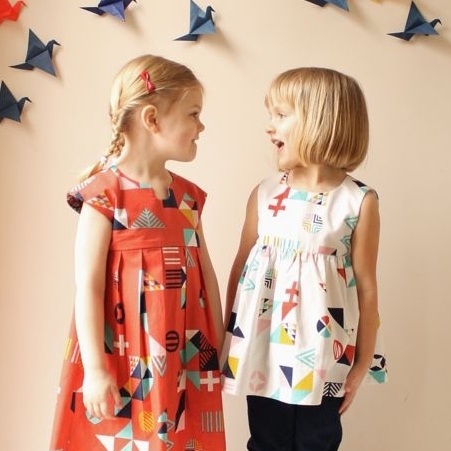 Cherie from You & Mie joins us today to share her favorite pattern, The Geranium Dress, by Made by Rae. With the amount of Geranium dresses and tunics that pop up in my rss reader everyday, you would think it’s the internet’s favorite pattern too. Cherie has taken this pattern and not only made many lovely dresses with it, but an absolutely beautiful coat as well! She is an extremely talented sewer and we’re so happy to have her here! Thanks Meg, for letting me share one of my favorite patterns with the KCW community! Honestly, most of you probably already know about the awesome Geranium Dress/Tunic pattern, as you should, because this pattern is AWESOME. 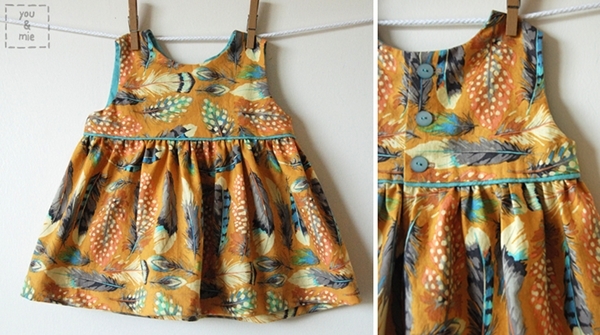 It’s another one by the talented Rae of Made by Rae (her upcoming Parsley Pants pattern was featured here yesterday). You’d think we were being paid to sing her praises, but I swear we’re not! She’s just that good. 1. The pattern is extremely well put together, with great charts and tables, awesome photos and diagrams, clear instructions, and tons of helpful hints and tips. The pattern is easy to print, cut and assemble. The whole package is just professional and high quality. 2. Versatility. The pattern itself comes with lots of choices for variations. You can choose from tunic or dress length, multiple sleeve options, necklines, skirt types and pockets. With the variations given, the combinations you can make are limitless! Plus, it’s just such a great basic pattern that you can go on to make your own changes as well – try different sleeve types, lengthen the bodice/drop the waist, different skirt styles, pockets or closures. Depending on what fabrics you choose, you can make it into a casual every day top, or a fancy special occasion dress. 3. 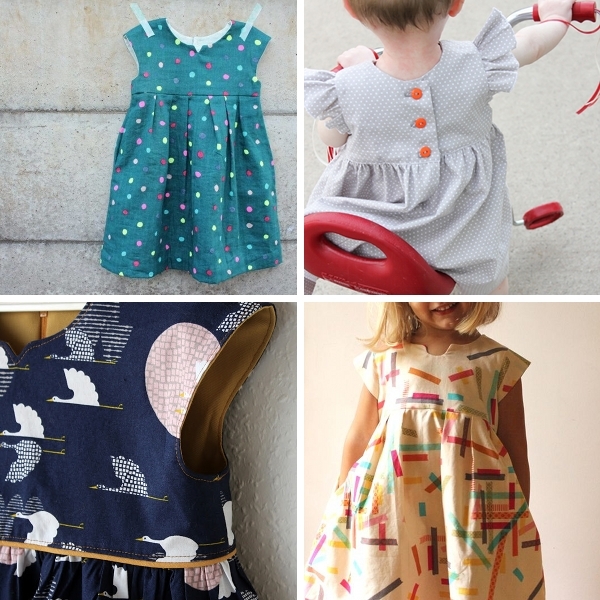 It’s an easy and fast sew! Between Rae’s awesome directions and the simplicity of the construction, you really can’t go wrong with this dress. Once you’ve made one or two, making more will be a snap and it comes out adorable EVERY. TIME. This is not a Geranium Dress, but I actually used the bodice pattern piece and altered it to make into a reversible spring coat! See the full tutorial here. There are tons of Geranium dresses and tunics already out there and you can see a lot of them in the flickr pool. It’s really impossible to pick my favorites, but here are some that caught my eye . . .
And Rae has a great post for adding trim to the Geranium, like piping, ric rac or mini pom poms that you definitely want to check out. AND Trine of Groovybaby….and mama has a great tutorial on how to add a zipper to the Geranium (instead of a button placket). I haven’t tried it yet, but I definitely will be trying that on my next one! I really think that everyone needs this pattern in their collection. So if you’re looking for something fun to sew up next week for KCW, put the Geranium Dress/Tunic on your list! In honor of this post, I sewed up a new Geranium, in feathers! So head over to my blog, you & mie, for more pics and details. Thanks for having me and happy sewing! I love it! The fabric choices paired with an already amazing/versatile pattern creates a one of a kind piece each and every time. I can swoon over each picture as if they didn’t come from the SAME PATTERN. 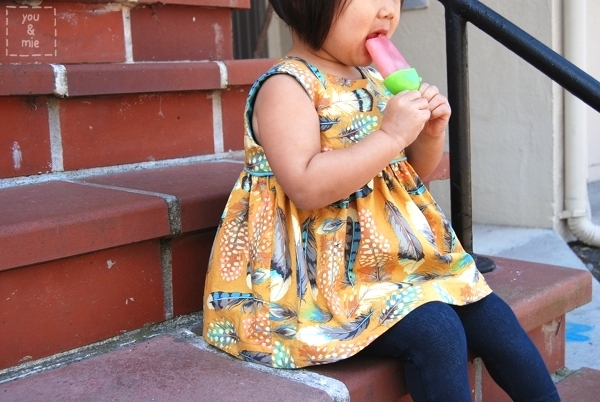 I really didn’t think i needed another dress pattern in my stash, but this has changed my mind. Thanks elsie for hosting this series and thank you to the contributors for giving us readers a little insight into your secrets! I was already to buy the geranium and then realized it only goes up to a 5 and my girl is a 5 now so really wanted to make a 6. Anyone know if it is going to go up larger? Hi Sara. I’ve tried to guide you on the sizes – but by mistake I put my reply under Natashas comment. Hope this will be helpful? the geranium is highly worthy of favorite pattern status – i love all your versions, cherie! Thank you for the link to the zipper tutorial! I tried to put an invisible zipper in my last geranium top and it went horribly wrong. Will have to try it again! I have this dress ready to make for KCW! I love every geranium you have made, Cherie and the new feather one is perfect! Beautiful work! I really need to make this pattern. And I have to know what pattern you used for the picture on the left in the banner above the title. I LOVE the eyelet Geranium dress!!! I finally bought the pattern to make a chiffon version for KCW!